Make this delicious cannellini bean dip for your favorite crackers or veggies! You can even use it as a tasty sandwich spread. Get the simple recipe! Combine all ingredients in a food processor and blend until very smooth, stopping to scrape down the sides of the food processor a few times to ensure even blending. 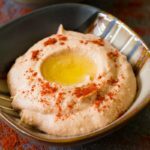 If the hummus is a little thick, add more water 1 tablespoon at a time and blend until smooth and creamy. Cover airtight and, if possible, refrigerate at least one hour before serving to let the flavors meld. Stir before serving and garnish (if desired) with a little olive oil and smoked paprika. Recipe for Perfection - https://recipeforperfection.com/ - Thank you for visiting!